The Florentines like tripe. The evidence is there for anyone who cares to take a stroll through the city's central market where sheets of the stuff hang off the stalls of vendors enjoying a brisk business. For the uninitiated, tripe is the stomach lining of an animal, usually, beef cattle. Not to everyone's taste, but to those who enjoy this rather chewy dish it's a delicious accompaniment to a glass of red wine from the Tuscan hills. The recipe can be adjusted with the addition of a finely sliced chilli or some chilli flakes to give it the kick favoured by the Neapolitans. The subject of offal could include kidneys, calf's brain or even pig's cheek but for the sake of more sensitive souls, it is probably best to restrict any further discussion to another passion of the Italians, namely liver. Or more accurately, calf's liver. The beauty of calf's liver is that it requires little in the way of cooking, the refined taste and texture being allowed to speak for itself. Ask the butcher to trim the liver and remove any remaining rubbery tubes in the flesh. The Venetians favour liver with onions, a classic combination that will be familiar to many northern European households. 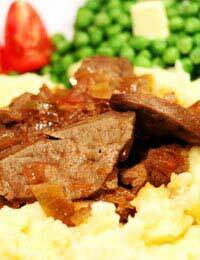 The Venetian liver works well in combination with a side plate of griddled polenta.